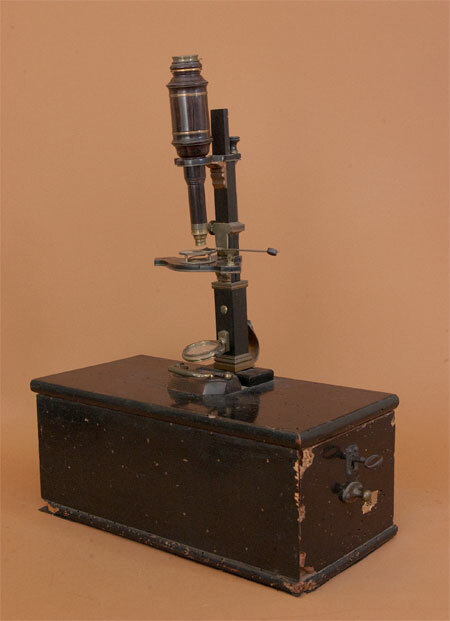 This microscope is modeled after the design of John Cuff, the English maker of scientific instruments. The microscope body mounts on a large, black lacquered wood chest (now riddled with worm holes). The chest has a drawer for storing the instrument, accessories and additional objectives. 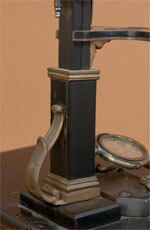 The microscope is not signed, but the construction material and the design of the chest suggests a French origin. The body tube is made of woodpossibly Lignum vitaewith brass and copper fittings. Fine focusing is accomplished by an adjusting screw, called a Hevelius screw, after the 17th century astronomer who introduced the mechanism on telescopes that he produced. The specimen stage is T-shaped with a Bonanni spring specimen holder. A forceps with a black/white disc is mounted on one side of the stage. A mounting hole on the other side is designed for a fish plate or epi-illumination (Bull's-eye) lens. 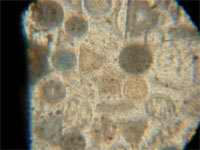 The microscope optics are the typical eyelens, field lens, and six objectives. The objectives and eyelens consist of a single biconvex lens mounted in a brass fitting. The substage mirror is mounted in a brass gimbal on the support shaft. A brass scroll acts as an additional support for the focusing pillar as well as a handle to lift the microscope out of its mounting hole in the top of the chest. A brass carrying handle is permanently mounted to the top of the chest. Accessories include a Lieberkuhn reflector, circular live-box, and six bone specimen slides. Imaging is poor, showing severe aberrations (chromatic and spherical).